In my quest for 12 socks (and slippers) in 2014, I've shared that I was up to pair #22. Well, I might have fudged a little. I'm really up to pair #28. Yep, I made Christmas slippers. From left to right, they are for (top row) my dad, my father-in-law, Dan (though these were given prior to Christmas because he is impatient), (bottom row) my mom, my mother-in-law, and my aunt. Of course, when gifting wool slippers to people, you do want to make sure you also haven't given them something that will make them slip and break their neck. (Newly made wool slippers are crazy slick - I've almost fallen more than once when my slippers were new or newly washed). So I put little non-stick bottoms on them! The bottoms are out of a product called Plasti-Dip, which is a liquid plastic I picked up at Lowe's used to put plastic handles on pliers and such. 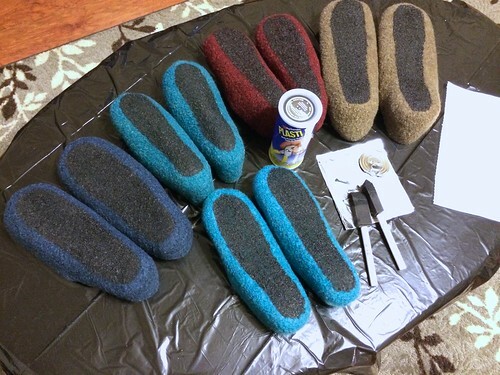 Instead, I put it on the slippers with a little foam brush. Honestly, it's so awesome. I'm kind of tempted to take the leftover Plasti-Dip and put it on my slippers (but I like sliding sometimes so I just can't quite bring myself to, no matter how neat it is.) I have about half a container of the dip left and, assuming it stays good, I do have thoughts of making myself a big fuzzy pair of slipper socks and putting bottoms on them. It's just too neat not to use. Yay for 28 pairs! I have one more pair that I'm almost done with (more socks for Dan) so I'm really hoping to get my total up to 29 before the year ends. Of course, if I could I'd love to get to 30, which is a nice round number, but I don't think I can knit a pair of socks that quickly... unless it is a big fuzzy pair? I can totally see why Claudia wants to wear them to work! I didn't want to leave home for an appointment yesterday because I didn't want to take them off! And, Aunt Grace, said she's the same. These are crazy things - awesome! They're addictive! Yay! I loved mine so much - that's why I decided to knit everyone a pair. 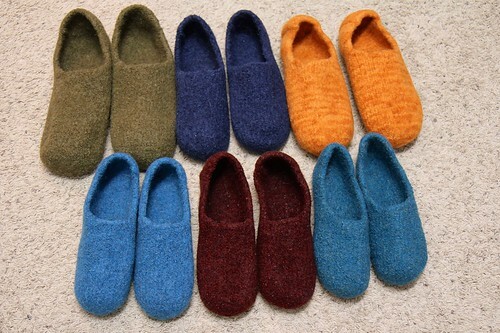 Felted wool slippers are just awesome!